Company - BCN Peptides. Generic and bulk peptides. BCN Peptides is a privately own company completely focused on the cGMP manufacture of Bioactive Peptides for Pharmaceutical and Veterinary applications. We are a customer oriented organization focused on fulfilling the client’s needs at each stage of the their peptide drug development and lifecycle management. It also includes a team of dedicated and passionate scientists which help us to provide to our customer a scientific excellence in terms of synthetic peptide chemistry and analytical expertise. Our Regulatory Affairs Department has more than 20 years of experience in filing DMF/CTD documents to different National Authorities Worldwide. 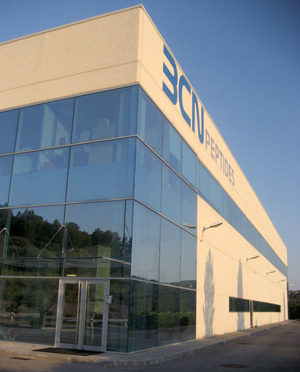 Our state of the art facility is located in Sant Quinti de Mediona (Barcelona surroundings) and offers 2.500 sqm of production area and laboratories dedicated to the GMP manufacture and control of Peptides. This facility has been specially designed by BCN Peptides applying all our know-how in Solid Phase Synthesis as well as Convergent Peptide Synthesis. It is equipped with the most advanced technology. We manufacture multi kg batches of GMP Peptides and we are specialists in long sequences and cyclic peptides. If you are looking for a partner to develop your peptide, the combination of our experience, our commitment and our state of the art facility makes BCN Peptides the best choice.